Go hunting for treasure in a lost jungle civilisation in Legend of the Jaguar, a 5 reel, 243 ways to win video slot from Playtech. Highlights of this rainforest trek include cascading reels with multipliers of up to 5x, respins with stacked wilds and 3 free spins rounds where you can alter the volatility depending on which round you choose. Play on your desktop, tablet or mobile from between 25p and £500 per spin. Playtech has created a cracking looking game here – set against a deep green backdrop, the stone-style reels form part of a lost jungle pyramid. You’ll see an assortment of hieroglyph and animal head symbols spinning around the reels. The best of the them is the jaguar which pays 100 times your bet if you land 5 on adjacent reels. The game is played using a Win Cascades and Multipliers feature – the successful stones are blasted away and new ones replace them. The initial win is paid at 1x. Each subsequent cascade comes with a multiplier which starts at 2x then rises to 3x and then 5x with the 3rd successive cascade win. The cascading reels aren’t the only extras on offer here. Jaguar Respins feature – this triggers if you land a jaguar on reel 3 on an otherwise unsuccessful spin. The jaguar expands into a stacked wild and the reels respin until a winning combination is created or you trigger the free spins. Double Multiplier Free Games feature – here you’ll receive between 10 and 15 free spins. The cascading reels are in play as in the base game. The multipliers on offer if you get on a roll are doubled though. An initial win pays 2x with subsequent cascade wins paying 4x, 6x and even 10x. This is the highest variance pick. Stacked Wild Free Games feature – 6 and 10 free spins are awarded. A stacked wild will land on at least 1 reel on each of them. This is the medium variance choice. Winning Free Games feature – the lowest option awards 6 to 8 free spins which decrease only after you have a winning spin. Landing 3 scatters will get you another of the same free spins. This means you could play 30 free spins with a massive 10x multiplier! There are plenty of similarly themed video slots already available but we enjoyed Legend of the Jaguar. The design, minus the animated Lara Croft-style character whose commentary had us reaching for the mute button, is impressively done. The same goes for the features. The cascading reels deliver a steady stream of action and the free spins round offers some decent potential. 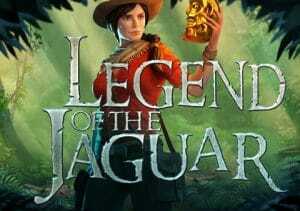 Put all that together and Legend of the Jaguar becomes a playable proposition, especially if you enjoy the jungle adventure theme. I would also recommend NetEnt’s Jungle Spirit: Call of the Wild.